﻿Back ﻿in ﻿2004 ﻿I ﻿want ﻿to ﻿build ﻿a ﻿6m ﻿repeater ﻿to ﻿play ﻿with ﻿on ﻿FM. 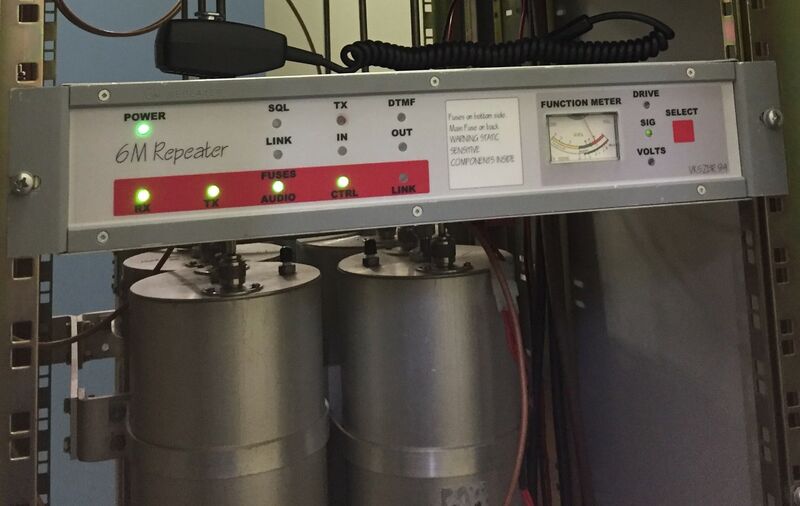 ﻿One ﻿part ﻿of ﻿the ﻿repeater ﻿system ﻿is ﻿the ﻿antennas. ﻿Do ﻿I ﻿use ﻿one ﻿or ﻿two ﻿antennas. ﻿The ﻿main ﻿disadvantage ﻿of ﻿two ﻿antennas ﻿is ﻿the ﻿cost ﻿of ﻿two ﻿of ﻿everything. ﻿One ﻿problem ﻿with ﻿a ﻿single ﻿antenna ﻿or ﻿two ﻿was ﻿I ﻿still ﻿needed ﻿a ﻿filters, ﻿the ﻿TX ﻿and ﻿RX ﻿frequencies ﻿are ﻿only ﻿1MHz ﻿apart. ﻿How ﻿Hard ﻿could ﻿it ﻿be. ﻿Well ﻿it ﻿took ﻿me ﻿6months ﻿of ﻿playing ﻿around ﻿to ﻿get ﻿what ﻿I ﻿needed ﻿in ﻿isolation. ﻿Lots ﻿of ﻿used ﻿coax ﻿and ﻿scrap ﻿copper ﻿in ﻿the ﻿bin ﻿trying ﻿all ﻿sorts ﻿of ﻿designs. ﻿Some ﻿of ﻿my ﻿designs ﻿I ﻿melted ﻿the ﻿acrylic ﻿formers ﻿I ﻿made ﻿for ﻿the ﻿helical&apos;s. ﻿Other ﻿designs ﻿I ﻿could ﻿not ﻿get ﻿to ﻿tune ﻿or ﻿were ﻿very ﻿hard ﻿to ﻿tune. ﻿First ﻿two ﻿photos ﻿show ﻿my ﻿second ﻿design ﻿using ﻿the ﻿larger ﻿helical ﻿cavity ﻿to ﻿get ﻿more ﻿Q. ﻿I ﻿made ﻿them ﻿from ﻿copper ﻿for ﻿easy ﻿prototyping. ﻿I ﻿ended ﻿up ﻿using ﻿aluminium ﻿for ﻿weight ﻿and ﻿cost. 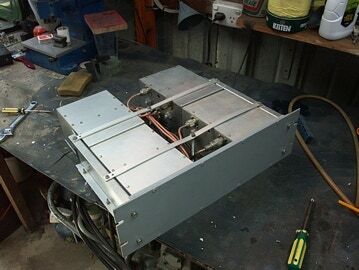 ﻿The ﻿cavity ﻿box&apos;s ﻿I ﻿bend ﻿up ﻿was ﻿with ﻿a ﻿new ﻿bender ﻿I ﻿made ﻿for ﻿the ﻿job. ﻿ I ﻿then ﻿anodised ﻿the ﻿box ﻿sections ﻿at ﻿home ﻿to ﻿protect ﻿the ﻿surface. ﻿Anodising ﻿aluminium ﻿is ﻿very ﻿easy ﻿and ﻿finishes ﻿the ﻿cavities ﻿really ﻿nice. ﻿These ﻿photos ﻿are ﻿taken ﻿of ﻿the ﻿filters ﻿after ﻿8 ﻿years ﻿of ﻿service, ﻿they ﻿still ﻿look ﻿new. 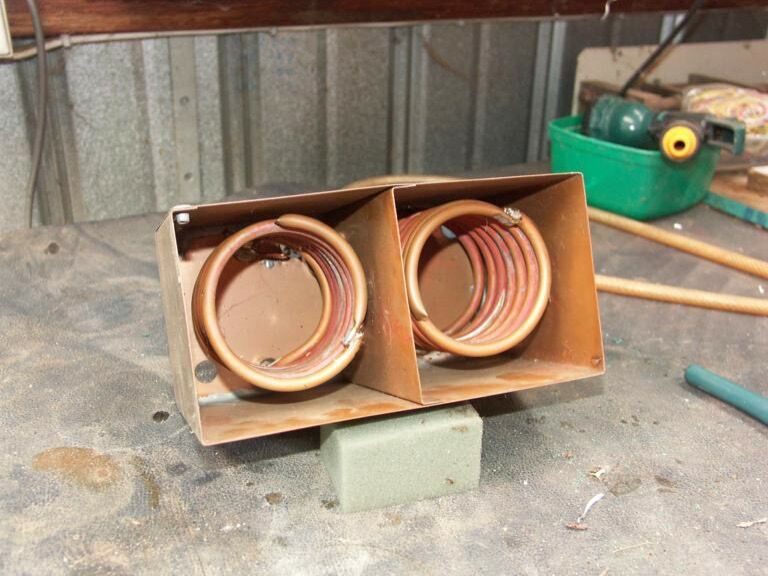 ﻿The ﻿helical ﻿coils ﻿are ﻿made ﻿from ﻿6mm ﻿copper ﻿tube. ﻿Easy ﻿to ﻿bend ﻿and ﻿light ﻿weight. ﻿I ﻿never ﻿tried ﻿aluminium ﻿tubing ﻿but ﻿may ﻿work, ﻿the ﻿losses ﻿may ﻿be ﻿higher. ﻿The ﻿copper ﻿tube ﻿was ﻿polished ﻿before ﻿the ﻿were ﻿rolled ﻿into ﻿shape. ﻿After ﻿I ﻿soldered ﻿the ﻿bolts ﻿to ﻿the ﻿coils ﻿I ﻿dipped ﻿them ﻿in ﻿clear ﻿lacquer. ﻿The ﻿original ﻿version ﻿of ﻿this ﻿design ﻿used ﻿copper ﻿bar, ﻿this ﻿would ﻿work ﻿harden ﻿as ﻿I ﻿bend ﻿the ﻿bar ﻿around ﻿a ﻿mandrel. ﻿This ﻿made ﻿it ﻿to ﻿hard ﻿to ﻿bend. ﻿The ﻿mounting ﻿nut&apos;s ﻿and ﻿bolt&apos;s ﻿are ﻿made ﻿from ﻿hexagonal ﻿aluminium ﻿bar. ﻿These ﻿I ﻿turned ﻿up ﻿on ﻿the ﻿lathe ﻿then ﻿use ﻿a ﻿tap ﻿a ﻿die ﻿to ﻿form ﻿the ﻿thread. ﻿I ﻿was ﻿worried ﻿about ﻿dissimilar ﻿metals ﻿effect ﻿on ﻿the ﻿cavities ﻿you ﻿see. ﻿Left ﻿you ﻿can ﻿see ﻿the ﻿helical ﻿units ﻿I ﻿made ﻿up ﻿as ﻿a ﻿diplexer ﻿unit. 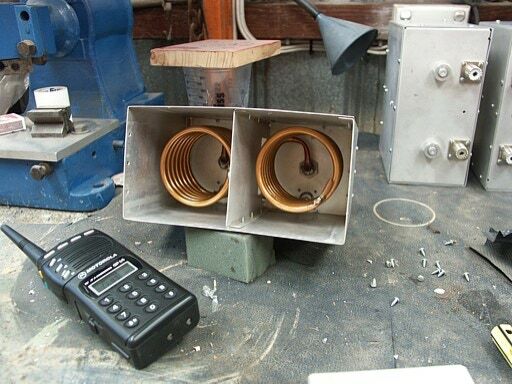 ﻿One ﻿antenna ﻿for ﻿the ﻿transmitter ﻿and ﻿receiver. 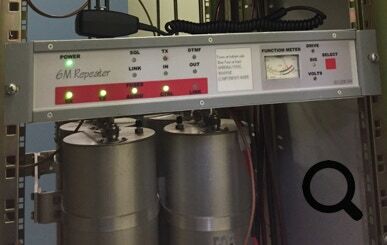 ﻿this ﻿configuration ﻿has ﻿one ﻿transmit ﻿filter ﻿and ﻿3 ﻿receiver ﻿filters. 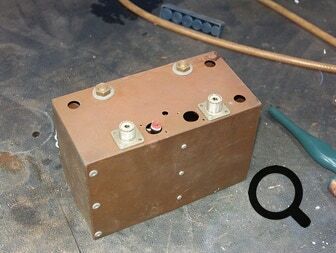 ﻿This ﻿gave ﻿me ﻿the ﻿isolation ﻿I ﻿needed ﻿for ﻿25Watts ﻿on ﻿transmit ﻿with ﻿no ﻿de-sence ﻿on ﻿the ﻿receiver. 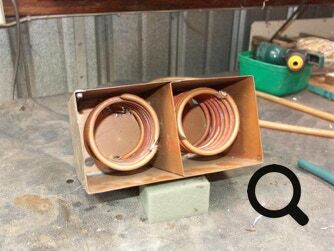 ﻿I ﻿found ﻿out ﻿a ﻿short ﻿while ﻿into ﻿testing ﻿the ﻿were ﻿a ﻿little ﻿microphonic, ﻿I ﻿reduce ﻿this ﻿down ﻿to ﻿minimal ﻿by ﻿place ﻿Styrofoam ﻿spacers ﻿between ﻿the ﻿cavities ﻿box ﻿walls ﻿and ﻿coils. ﻿This ﻿stopped ﻿all ﻿movement ﻿and ﻿fixed ﻿the ﻿problem. ﻿The ﻿reason ﻿I ﻿didn&apos;t ﻿use ﻿a ﻿former ﻿for ﻿the ﻿coils ﻿was ﻿losses. ﻿I ﻿did ﻿measure ﻿quite ﻿a ﻿few ﻿dB ﻿of ﻿losses ﻿in ﻿my ﻿trials ﻿and ﻿this ﻿cause ﻿the ﻿Q ﻿to ﻿drop. ﻿At ﻿some ﻿stage ﻿I ﻿will ﻿go ﻿through ﻿my ﻿notes ﻿and ﻿draw ﻿up ﻿some ﻿plans ﻿to ﻿show ﻿how ﻿to ﻿make ﻿them, ﻿its ﻿been ﻿years ﻿so ﻿good ﻿luck ﻿to ﻿my ﻿self. 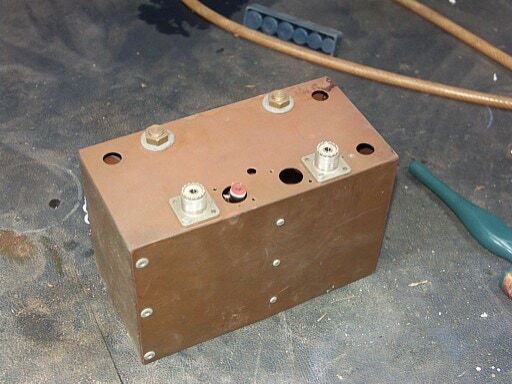 ﻿The ﻿Summertown ﻿repeater ﻿VK5RSB ﻿has ﻿been ﻿for ﻿at ﻿least ﻿15 ﻿years ﻿been ﻿using ﻿a ﻿new ﻿diplexer ﻿built ﻿by ﻿AREG ﻿members ﻿Peter ﻿VK5TZX ﻿and ﻿Graham ﻿VK5GH, ﻿these ﻿use ﻿helical ﻿loaded ﻿cavities. ﻿These ﻿are ﻿1.5m ﻿high. ﻿these ﻿have ﻿a ﻿higher ﻿power ﻿rating ﻿and ﻿the ﻿losses ﻿are ﻿down ﻿to ﻿1.2dB ﻿compared ﻿to ﻿my ﻿2.3dB. ﻿Since ﻿we ﻿wanted ﻿more ﻿power ﻿and ﻿less ﻿loss ﻿we ﻿switch ﻿over ﻿to ﻿these. ﻿This ﻿whole ﻿project ﻿started ﻿because ﻿someone ﻿said ﻿it ﻿can’t ﻿be ﻿done. ﻿Don’t ﻿every ﻿say ﻿that ﻿to ﻿me ﻿:) ﻿it’s ﻿like ﻿calling ﻿Marty ﻿Mc ﻿Fly ﻿chicken. ﻿My ﻿secret ﻿weapon ﻿was ﻿a ﻿good ﻿group ﻿of ﻿smart ﻿ham ﻿friends ﻿and ﻿the ﻿Handbook ﻿of ﻿Filter ﻿Synthesis, ﻿chapter ﻿nine ﻿has ﻿a ﻿helical ﻿filter ﻿design ﻿section. ﻿Some ﻿one ﻿lent ﻿me ﻿the ﻿book ﻿and ﻿I ﻿copied ﻿the ﻿whole ﻿lot, ﻿so ﻿it ﻿must ﻿of ﻿been ﻿too ﻿expensive ﻿for ﻿me ﻿at ﻿the ﻿time. ﻿My ﻿test ﻿equipment ﻿was ﻿quite ﻿crude ﻿at ﻿the ﻿time. ﻿I ﻿had ﻿a ﻿analogue ﻿signal ﻿generator ﻿then ﻿upgraded ﻿to ﻿a ﻿Marconi ﻿analogue ﻿service ﻿monitor ﻿and ﻿a ﻿Electronic ﻿Australia ﻿spectrum ﻿analyser ﻿kit ﻿using ﻿my ﻿CRO. 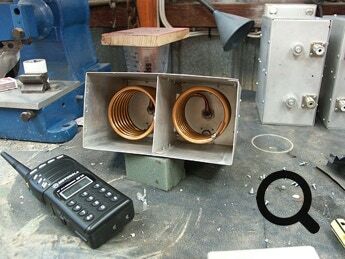 ﻿The ﻿home ﻿made ﻿stepped ﻿attenuator ﻿was ﻿the ﻿key ﻿in ﻿calibrating ﻿the ﻿spectrum ﻿analyser ﻿this ﻿was ﻿a ﻿project ﻿in ﻿it ﻿own ﻿right. ﻿I ﻿would ﻿manually ﻿plot ﻿my ﻿results ﻿on ﻿paper. 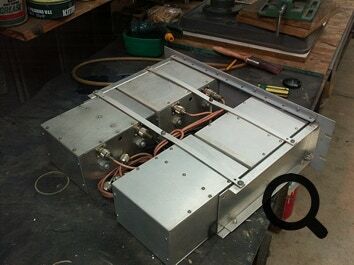 ﻿I ﻿did ﻿a ﻿lot ﻿of ﻿work ﻿on ﻿a ﻿10m ﻿repeater ﻿diplexer ﻿with ﻿a ﻿100Khz ﻿split, ﻿But ﻿I ﻿gave ﻿up ﻿after ﻿many ﻿hours. ﻿I ﻿got ﻿as ﻿good ﻿as ﻿250kHz ﻿split. ﻿If ﻿get ﻿really ﻿bored ﻿one ﻿day ﻿I ﻿may ﻿give ﻿it ﻿another ﻿try, ﻿the ﻿maths ﻿said ﻿it’s ﻿possible ﻿with ﻿enough ﻿Q.